Need a new glass shower door? Visit Top Shelf Closets & Glass in Edmonton. Top Shelf specializes in cutting and installing custom glass shower doors with a variety of glass finishes to choose from so you can achieve any desired look for your new shower or get a matching replacement part for an old or damaged item. Top Shelf works closely with home builders, renovators, infill specialists and retail clients to exceed customer expectations. All of our custom glass is cut and installed to the highest standards with tempered safety glass. We can help with shower glass replacement or a new and completely custom shower door. From builder-basic to beautifully-crafted works of art, we’ve got you covered when it comes to shower glass and finishes available. Regardless of your budget, we can help design custom shower glass doors and enclosures for any home. Frameless glass shower doors are stunningly beautiful in their simplicity. A frameless glass shower lets you show off your entire bathroom and showcase eye-catching features such as high-end shower door handles and hardware, tiling or décor. A frameless glass enclosure also gives the impression of increased space and allows more light to flow through the room. Use textured glass to enjoy full privacy without blocking out any light, or clear glass to show off your bathroom’s decorative features. 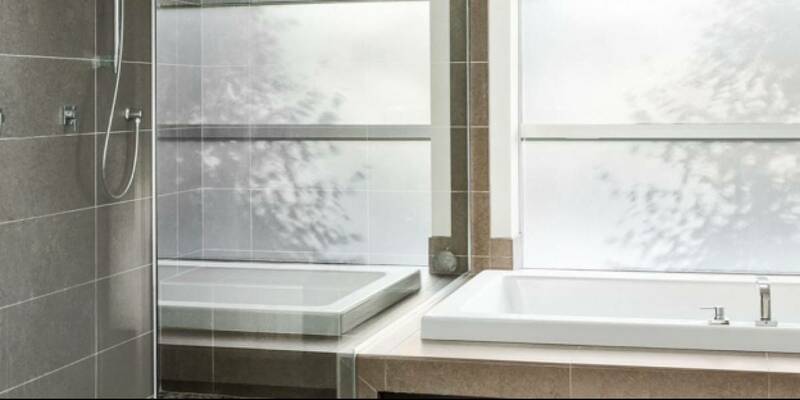 Top Shelf has a wide range of custom glass finishes available, including a rain effect for a soothing spa-like feel. Our frameless glass shower doors are installed with durable, heavy 10MM glass which gives your bathroom a sleek and modern look. This ensures safety and longevity without taking away from the aesthetic appeal of the frameless design. If your budget doesn’t allow you to go fully frameless, you can achieve a similar effect with a semi-frameless shower instead. Our builder grade, semi-frameless glass shower doors are durable and classic. Semi-frameless showers usually combine framed fixed glass with partially-framed hinged or sliding doors. Framed glass doors have a covering on every edge around the door, where semi-frameless doors may have only a drip rail at the bottom or a header at the top. These custom fit shower doors won’t break the bank, yet still provide you with a variety of hardware, glass and style options to suit any bathroom. Semi-frameless or framed sliding shower doors are a sleek, modern and budget-friendly way to save space. Frameless sliding doors are designed to roll along a low-profile bar at the top of the door, maximizing the aesthetic appeal by including a minimal amount of visible hardware. We also have a variety of frameless sliding glass shower door hardware to choose from. We can help you match your shower enclosure to complement the rest of the room’s hardware and decor. Top Shelf Closets & Glass can design and install new glass shower doors and enclosures for your bathroom – custom cut to fit any size or shape of shower. We are able to create custom shower enclosures based on measurements provided by the client, though some products may require us to take exact measurements for proper fitting. If Top Shelf is providing the installation, we always come take measurements first to avoid any unnecessary delays or issues during the installation process. Our skilled professionals will come out to your property to take all necessary measurements, manufacture and tailor the pieces at our in-house glass facility, and then return to complete the installation. We also offer free design consultation services, so you can get professional guidance or a quick second opinion before you go ahead with any project. Our staff can help you save time and stress, avoid making costly errors, and bring your vision to life. Visit our 6,000 square foot showroom in Edmonton to see the products on display and consult directly with our knowledgeable and helpful staff. We offer a fantastic selection, excellent inventory and competitive pricing, and we are always bringing in new products. Contact us to book a free design consultation or ask us any questions about shower doors and enclosures. We know your time is valuable, so we strive to respond to all inquiries within 2 business days or sooner. Top Shelf Closets & Glass is centrally-located and easy to find. Come see us at 9719 63 Ave in Edmonton (on the corner of 97 Street and Argyll Road). Time for a New Shower Door? Call or visit our Edmonton showroom to talk to a design consultant at Top Shelf Closets & Glass for the best guidance on your glass shower door.